The British Worker - TUC general strike newspaper 1926. 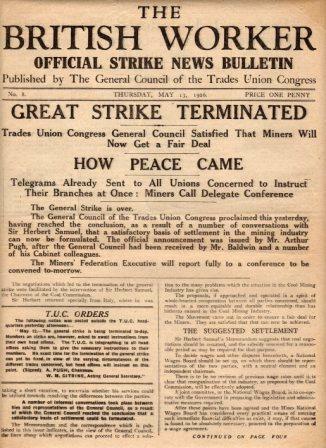 This rather sad memento of the 1926 general strike is the 13 May edition of The British Worker, announcing the TUC General Council’s decision to end the strike and organise a return to work. Despite its upbeat tone, the strike had ended in defeat for the miners and disaster for the trade union movement. The British Worker was launched by the TUC at the beginning of the strike and printed on the presses of the Daily Herald. This particular paper was the eighth in the run. There would in total be 11 before publication ceased on 17 May 1926, with circulation peaking at half a million. Further examples of the paper can be seen on the Union Makes Us Strong trade union history website. The National Asylum Workers Union was founded in 1910, largely as a result of dissatisfaction with a new national pension scheme introduced for mental health workers the previous year. Though heralded as a breakthrough by the then dominant Asylum Workers Association, the scheme was considerably worse for some asylum workers than the discretionary schemes it replaced. Their frustration came to a head in Lancashire, where agitation and petitions to improve the new scheme’s terms failed to sway members of the county asylums board. The new union’s slogan, “All for one and one for all: thou shalt love thy neighbour as thyself”, was adopted early on at the same meeting, at the Boar’s Head Hotel, Preston, on 24 September 1910, at which the union was named. The first half of the slogan can be seen on the union’s badge. By July 1912, the NAWU had 5,400 members and a paid general secretary, the Rev HMS Bankart, a former mental hospital chaplain. It affiliated to the Labour Party in 1915 and to the TUC in 1923. One of its first disputes, at Bodmin Asylum in October 1918, broke out when nurses were ordered to remove their union badges and refused to do so. Five nurses were sacked, and 34 more walked out in sympathy (from a staff of 70). Within a week, male staff at the hospital had joined the strike, and the visiting committee was forced to back down, reinstating all those who had been dismissed and permitting them to wear their union badges. The union changed its name in 1930 to the Mental Hospital and Institutional Workers Union and, with the backing of the TUC, began to recruit in opposition to the National Association of Local Government Officers (NALGO). In 1946, the MHIWU merged with the smaller Hospital and Welfare Services Union to form the Confederation of Health Service Employees, under which name it continued to operate until 1993, when it was one of three founder unions of the new Unison public services union. Its partners were the National Union of Public Employees and NALGO. 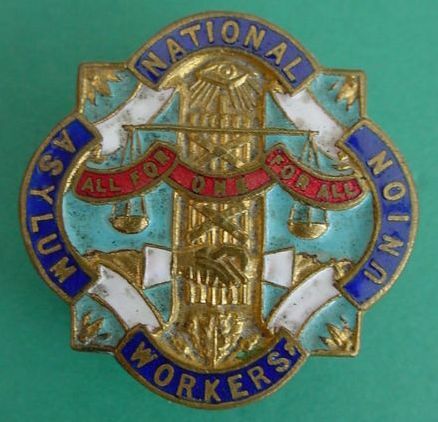 More on the history of the National Asylum Workers Union and its successor unions can be found on Michael Walker’s COHSE blog.